Since the revolution that toppled Hosni Mubarak two and a half years ago, the armed forces have consistently been held in high regard by the Egyptian people. In a Pew Research Center poll conducted in March, fully 73% of Egyptians said the military was having a good influence on the country, down somewhat from the 88% registered in a 2011 survey conducted a few weeks after Mubarak was pushed out of office. 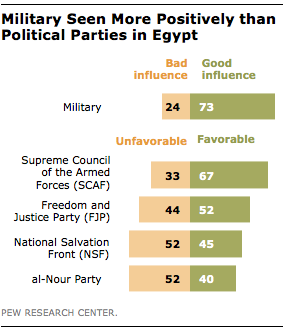 Moreover, the ideological and partisan divisions that characterize Egyptian public opinion on a variety of issues are not apparent in views about the military. Among supporters of both the Salafist al-Nour party and the Muslim Brotherhood affiliated Freedom and Justice Party (FJP), nearly eight-in-ten said the military was having a positive influence. Similarly, seven-in-ten held this view among supporters of the National Salvation Front (NSF), a more secular coalition of opposition forces. The Supreme Council of the Armed Forces (SCAF), the military’s governing body, also receives high marks. Two-in-three Egyptians (67%) had a positive view of the council. Of course, today’s announcement could have a major impact on public opinion – it’s likely that FJP supporters will react negatively to the ultimatum – but it is clear that the military comes into this crisis with a stronger public image than many of the country’s key political players. For example, the March survey found mixed views regarding the nation’s largest political parties. About half (52%) had a favorable opinion of the FJP, while 44% expressed a negative view. Meanwhile, ratings for both the NSF (45% favorable, 52% unfavorable) and al-Nour (40% favorable, 52% unfavorable) were on balance negative. Egyptians Have Sharply Negative Attitudes Towards the U.S.